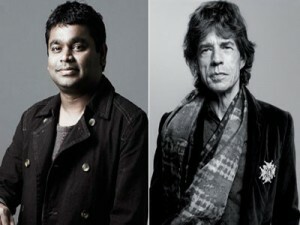 A R Rahman, Mick Jagger, Joss Stone and Damien Marley have released a peep into their recording studio as they make their first number, Miracle Worker. Rahman is not as animated as his counterparts, and has a small singing part -- at least in this clip -- making us really want to see more of him. The band -- called SuperHeavy -- sees great talents coming together but makes us wonder why we don't see too much of that in the song. Of course, it's still much too early to talk about the song, or the band, and we can't wait to hear more from them.